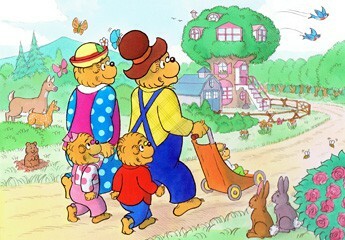 Our blog this year has reflected on the Berenstain Bears and their creators Jan, Stan, and Mike Berenstain as they mark their 50th Anniversary. In celebration of our anniversary, HarperCollins Children’s Books and Random House Children’s Books worked with Jan and Mike to document the creation of the Berenstain Bears. Filmed just 3 weeks before her death in February 2012, Jan never saw the completion of the five videos. Now, for the first time ever, Random House and HarperCollins have released excerpts from this phenomenal interview for all to see. We are very grateful to Harper Collins and Random House for these wonderful and very timely videos of our beloved Jan Berenstain.